Home › News & Articles › Reports › Superb international victory for Jean-Paul Balcaen (Aix-Noulette, FR) on Agen! Superb international victory for Jean-Paul Balcaen (Aix-Noulette, FR) on Agen! Jean-Paul Balcaen & his international winner. Jean-Paul Balcaen (58 years and working for an industrial company) is not really known on the international scene but it doesn't mean he is not an accomplished fancier. While we are currently making a lot of publicity from almost nothing, this fancier is only starting to become a respected fancier from the marathon races but it's been years that his results from this discipline are incredible. Three years ago, Jean-Paul Balcaen had a fantastic season as he had (already) won the French national race from Agen as well as the 1st national Pau, good for the 2nd international against 9,062 pigeons, just behind the famous Cas from Joost De Smeyter-Restiaen. His international victory last week from Agen is then well deserved and puts this French fancier into a group of the most renowned fanciers on the international pigeon scene. Despite his fantastic results, this fancier considers himslef more of a breeder than a racer. In fact, he takes his pleasure more from the breeding than from the racing. The least we can say, is that whilst we know what he is able to do racing-wise, he keeps his two feet on the ground and that the success didn't change his world. That's for sure the mark of a champion. Balcaen is running a medium sized loft with about 40 widowers, about fifteen breeding pairs and 30 yearlings raced on the singlehood system. He is racing at all distances but he likes much better to enter his birds in the international races. The base of his pigeon loft is built around the old strain from Batenburg-Van de Merwe, mostly through the line of the Witbuik. As we explained before, Balcaen mostly likes the breeding aspect of the pigeon sport and his pigeons are most of the times strongly inbred against each other. The international winner from Agen accomplished a strong presentation this 29th of June. 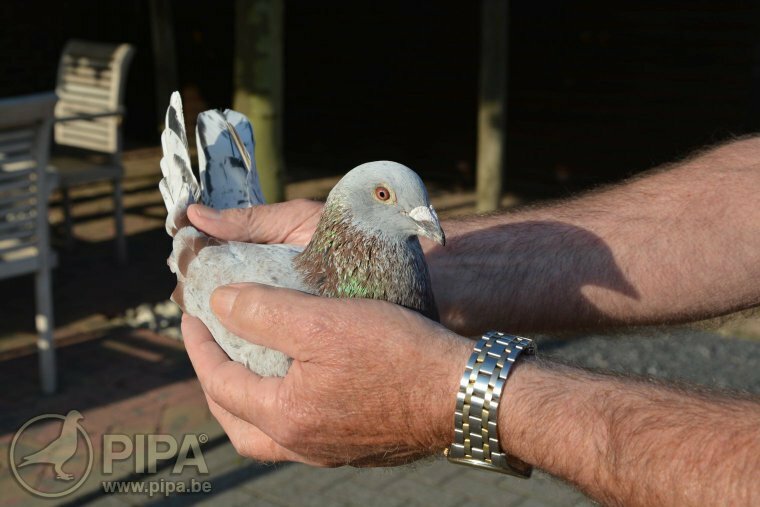 With his 1.003 m/minute, he is the only pigeon from the 24,850 entered to climb above the rung of the 1.000 m/min, which gives you a very good idea about the difficulty of this race! One has to say that he was bred from a fantastic family as you will notice it while browsing through the performances of two of his brothers. His parents are composing what we can now consider as the golden pair of the Balcaen loft and, as a passionate breeder, Jean-Paul probably already established a new strategy to continue to harvest their fruits for the coming years. Highest speed from 24,850 p.
Direct AP Overwater (NL) and son of Lady Pronk, a hen who won a.o. the 5th St-Vincent national against 5,336 pigeons. Excellent breeding hen, also mother to the 1st, 35th & 36th national Agen '15 but also 38th, 44th & 47th international Narbonne 2011 & 2014. She was bred from noble blood as she is an inbred product of the famous Witneus from the late Roger Floorizoone, 1st national Barcelone 14,034 in 1999 (his father was bred from a pairing brother x daughter Witneus). 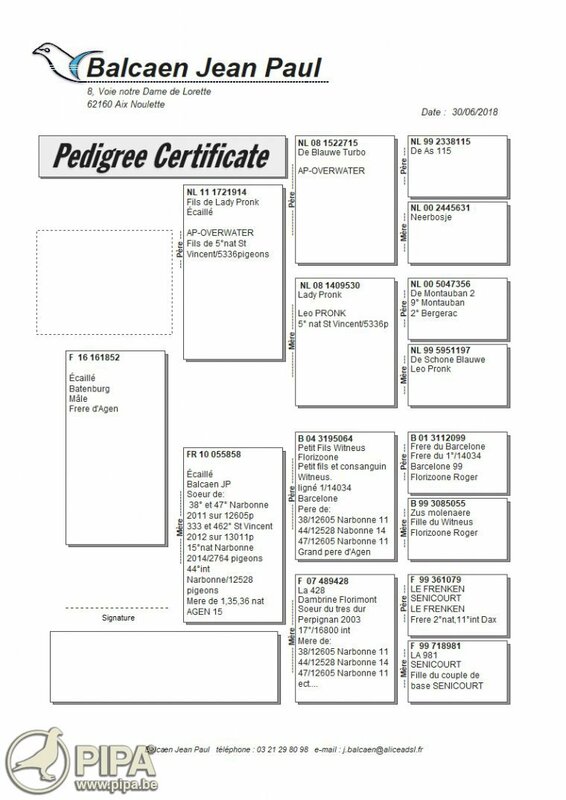 Click here to check the pedigree. 13. Internat    -  4,485 p.
528. Internat   - 11,285 p.
93. Internat    - 11,515 p.
197. International -  4,524 p.
481. International - 11,285 p.
368. Internat      - 11,515 p.
10. 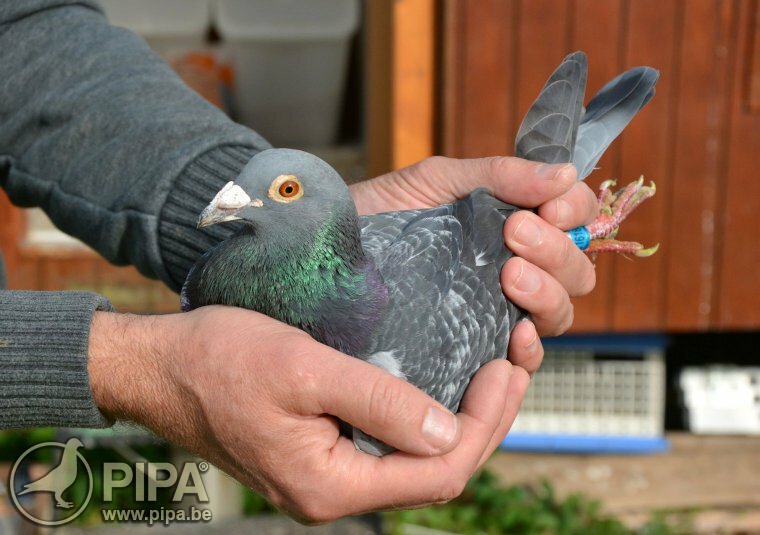 Agen national     -  2,039 p.
Thanks to his fantastic victory booked from Agen, Jean-Paul Balcaen was definitely put under the international spotlight of the Belgian pigeon sport, even if his performance list made him a feared and respected fancier before. We are sure that he will try again to let the class pigeons of his loft talk from the next international races of the season! Good luck & congratulations!